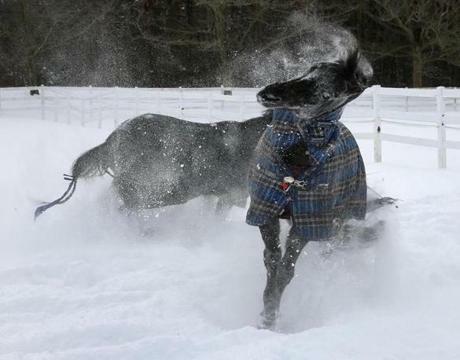 A horse named Tucker shook his head while playing in the fresh snow at Briggs Stables in Hanover. 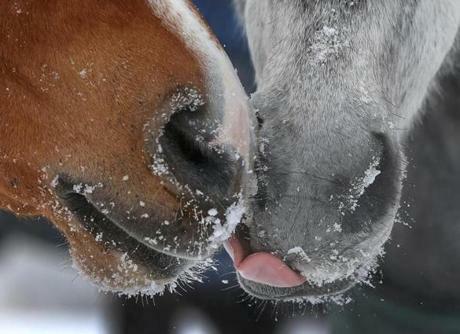 Horses Louis and Taz licked snow at Briggs Stables in Hanover. 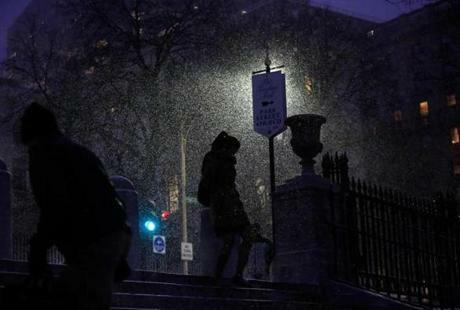 Pedestrians made their way through the snow on Boston Common. Dallas Masters, left, and Brian Ash shared an umbrella on the Public Garden. 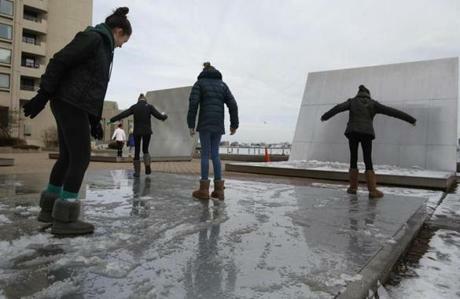 Sarah Bettigole, 13, of Wellesley and friends slid along one of the sculptures that line the Harbor Walk in Boston. 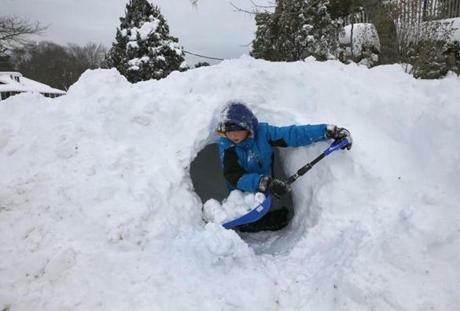 Record snowfall helped Tanner Paul, 10, build a fort in the snow in Hanover, which got up to 18 inches. 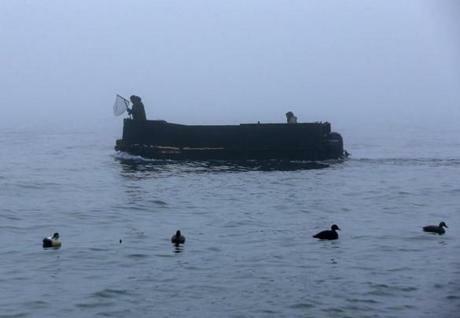 Duck-hunting guide Adam Smith Jr., left, readied his net to pick up birds that had been shot, as his father, Adam Smith, steered in early morning fog off Deer Island in Boston Harbor. The ducks in foreground are decoys. Young piglets huddled under a heating lamp near their mother (in shadow) at Westminster Meats in Westminster Station, Vt.
A pedestrian was reflected in a car windshield as she walked along Newbury Street in Boston. 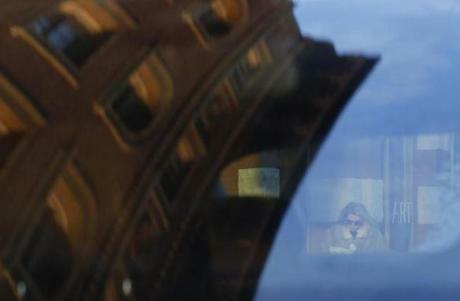 Samantha "Sam" Emerson, 26, a recovering addict who is unemployed, waited for eviction papers Fairfield, Vt., in a rural area that is hard hit by drug problems. 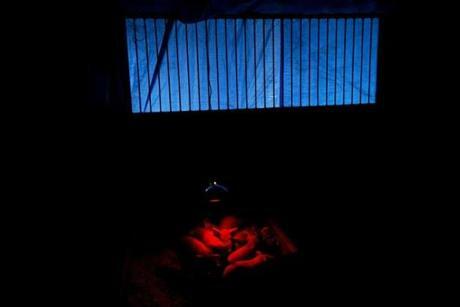 Homeless men who came in from the extreme cold stretched out in the locker areas at the Pine Street Inn in Boston. 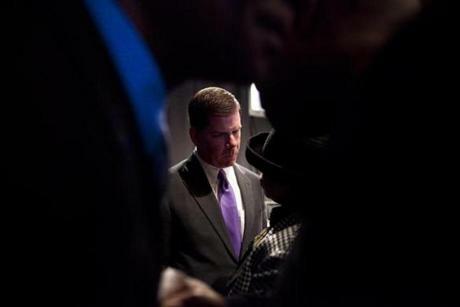 Boston Mayor Martin Walsh was the center of attention at the 44th annual Martin Luther King Jr. breakfast held at the Boston Convention Center. William Evans was sworn in as police commissioner by Boston Mayor Martin Walsh at the Salvation Army's Kroc Center in Boston. 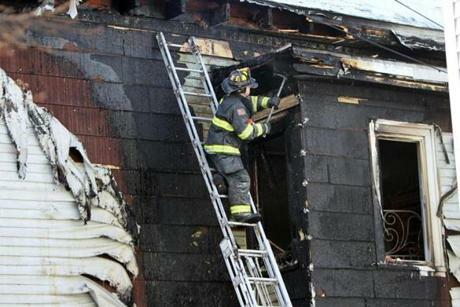 A firefighter checked for hotspots after a fire broke out in a Somerville multifamily home on Mt. Vernon Street. 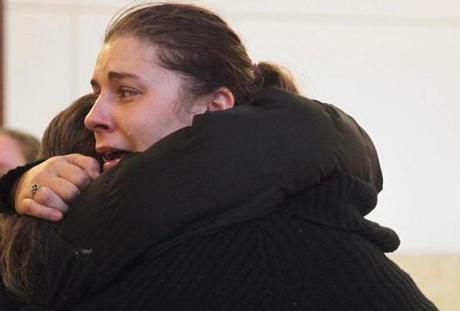 Desiree Gilman and other family members reacted after Christian McFadden was denied bail after being arraigned on assault and battery charges of his 11-month-old cousin at Worcester District Court. 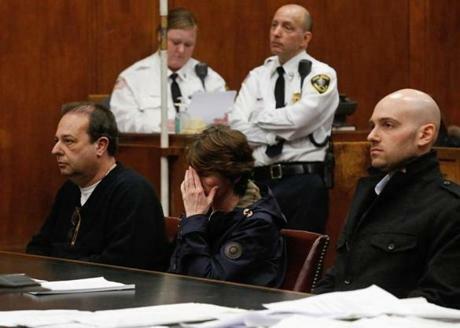 Steven Palladino, his wife, Lori, and son Gregory pleaded guilty to a $10 million Ponzi scheme at Suffolk Superior Court in Boston. 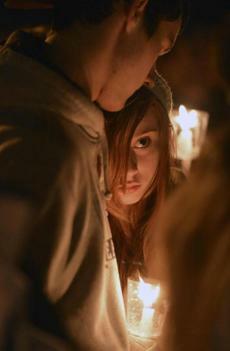 Jessy Alexander, 16, and Bre'Anna Erich, 15, were among hundreds who came to the Franklin Common for a vigil in honor of the two children who suffocated inside a chest a week prior. 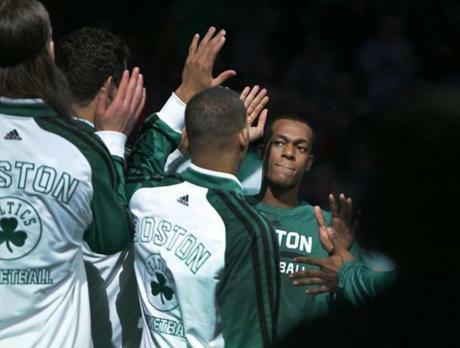 Boston Celtics point guard Rajon Rondo high-fived his teammates as he was introduced at the start of the Lakers game at TD Garden. It was Rondo’s first game since suffering a knee injury a year ago. Boston Bruins left wing Brad Marchand gave away his stick after being named the player of the game at the conclusion of the third period of play against Los Angeles Kings at TD Garden. 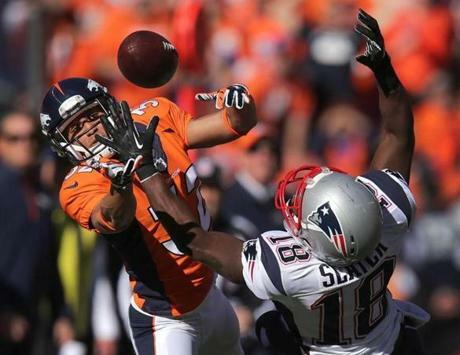 Denver Broncos cornerback Tony Carter broke up a long pass intended for New England Patriots wide receiver Matthew Slater in the first quarterof the AFC Championship game at Mile High Stadium in Denver. 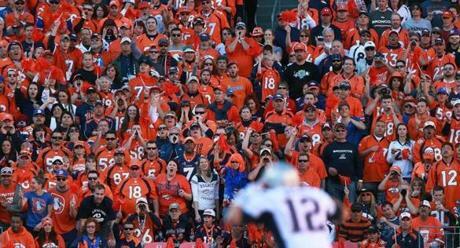 Patriots quarterback Tom Brady (12) tried to bark out signals despite the screams of the very loud Broncos fans. 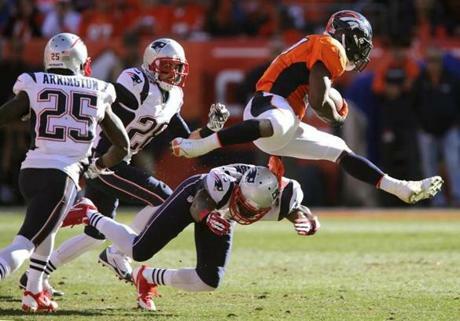 Denver Broncos running back Knowshon Moreno leaped over New England Patriots strong safety Duron Harmon as he broke loose for a long gain. 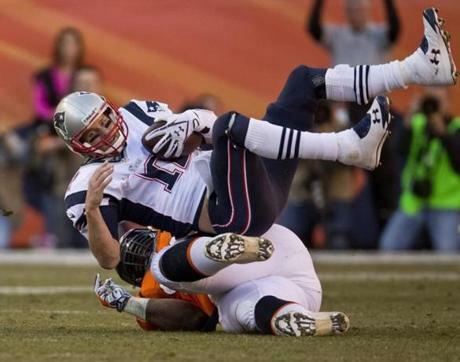 Tom Brady was sacked by the Denver Broncos’ Terrance Knighton.